Business conglomerate Piramal Enterprises' philanthropic arm has launched Piramal School of Leadership at Bagar in Jhunjhunu distrcit of Rajasthan. The Piramal School of Leadership (PSL) offers three year Principal Leadership Development Program for government schools headmasters to develop leadership skills and relevant knowledge to impact the quality of education in the schools. "The schools aims to offer a Masters' degree to the headmasters in the areas of education leadership, district education management, coaching for school improvement, instructional design, educational assessment and policy design," says an official of the Piramal Foundation. Commenting on the launch of the PSL, Piramal Enterprise Chairman Ajay Piramal says "The thought of starting the Piramal School of Leadership was inspired by one of Swami Vivekananda's quote, 'Give me few men and women who are pure and selfless and I shall shake the world'." Though a unique model of educational leadership the headmaster's competencies will be sharpened by enhancing their leadership skills, he added. This programme is designed to train school headmasters below the age of 50 years towards managing the complete gamut for operating the school, including the mandates of the Right to Education Act, Piramal Foundation head Paresh Parasnis said. 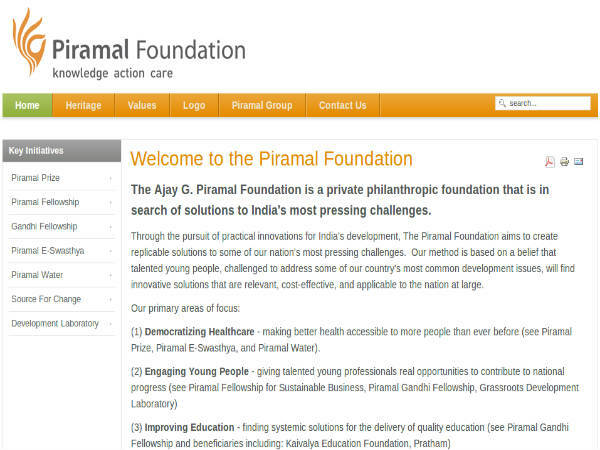 Piramal Foundation works in four main areas- healthcare, education, livelihood, creation and youth empowerment.